Spiritual Evolution of the Bean: Monetizing one's art - What would you do? I think it's finally time that I do something more with my art than posting it to the web - but I have to admit, I am completely overwhelmed with the thought of selling my work. My sticking point is that I never ever create my art (specifically my mandala art) with the intention of trying to make money from it. I create art as a form of spiritual self expression - a meditative release if you will, but I can't help but noticing that there are a few of my images that people seem to really like... a lot. Seeing that I do need to eat on a semi-regular basis, and that my husband would surely love me to generate more than hot air... I'm willing to consider my options. When selling art, there seems to be a million different ways to do it. I can sell prints, t-shirts, greeting cards.... I can use do-it-yourself sites like Cafe Press, Zazzle, Etsy, or any of a number of other similar sites. There is part of me that would like to do something that's a little different than just prints & greeting cards, and after I completed the above image, I was thinking that this particular image would make for a really cool reverse lino block print on a t-shirt. But that would mean that I would have to figure out how to transfer the design & carve it out, then print them. A great idea in theory, but one that might take up more time and effort than I currently have available. If you were me, what would you do? Do you have any experiences that you can share with me on how you reproduce your art for sale? Or maybe how you prefer to purchase your art? Right off the top of my head, I would suggest looking into teaching. Whether it's at a spiritual retreat center, or a workshop at your local Cheap Joe's it would be a nice way to make an income and stay true to your meditative focus. Also, you could possibly create, advertise and host workshops in your town. And you could sell your art as originals on places like Etsy. You might want to open an Etsy shop and try to sell a few pieces to get some reactions. Whatever you do....much good luck! I think making shirts would be cool! Your designs would look great on it. Maybe you can consider screen printing. It's not too difficult if you want to try, and you can make drawings and photocopy them onto a trasparency. It works really well! You might have to spend a little on a kit, but it might be worth it. Also, Jacquard makes an inkjet fabric, and Golden has inkjet mediums you can paint onto surfaces, if you would rather make prints of your photos using a digital medium. Vectorizing them would not be too difficult either, if you have illustrator. You can use your photos rather or a scanned image it works well. Since your mandalas are line based, it would be easy to translate. If you need help to it let me know. I would be happy to, and it really does not take very long to do at all. I don't have any ideas about selling, but, I had to comment on your statement about not creating art with the intention of selling it. I think that is generally the best art. Once an artist is in the mindset of making art for the sake of sales they make art that is more mainstream. Personally I would love to be able to make a living with painting and drawing, but, if that is why you draw or the only reason, then your art itself would suffer. If you can sell the art you make for arts sake then you are blessed, and good luck. There are lots of ways of approaching it, but whatever you do, I would strongly recommend a digital image of your favorite designs as you will need these for most forms of reproduction. $75 seems high to me, too. Even so, you might get a better deal if you have 5-10 done at the same time. I would shop around for this service locally as well as online. If you are looking to reproduce items that are not in the realm of fine art, you may find your scanner and digital editing software to be adequate. For example if you wanted to convert your images into embroidery, a super high-res image would be overkill. With your background and love of journals and fountain pens, I could see some of your designs being awesome journal covers or even printed notepads. Mandala pens or pen case would be interesting and I imagine that some of your readers would be interested in these as well. There are manufacturers out there who will incorporate your art on to journal covers and pads. Some of them might even be interested in licensing your images for their products. I don't have enough room here to throw out the many directions you could take this, but I would be happy to discuss it with you. If you would like to contact me email me at cynthia@journalingarts any time. I would love to help you figure this out. I have had lots of experience with illustration and reproduction would love to be able to put it to good use by helping out a fellow artist. I am glad to hear you are considering this. Your mandalas are beautiful. I know this is a difficult thing. You might want to check into Henry Reed PHd and his mandalas. He sells small ones that he makes for specific people for $100..he sends them on a piece of board, wrapped in cellophane. He also lets people pick whatever ones he likes (he creates one and posts it online every day) on clothing and bags. If I were to see mandala t-shirts of sale somewhere, I'd buy one (or two). Since many of your art fans are from the fountain pen, art, ink, etc. world, I think that paper items would be a hit. You'd be able to pick wonderful fp friendly paper and this would make you even more of a goddess than you already are! Maybe talk to one of your drum groups and do a shirt design for their next show? CD cover for your favourite musician you hang with? I like the note card idea, but think you'd also need a venue to sell them - maybe as an add-on to a drum festival or music event? You have great designs and a giving spirit - I know that the match will be made and I'm wishing for sooner! 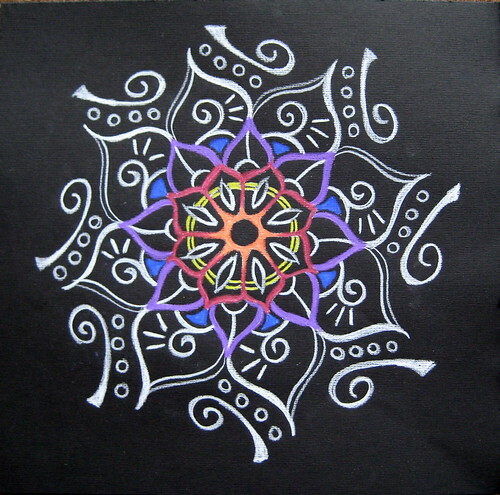 I agree with the paper items, though I would love to see your mandalas available on a mouse pad as well! Also, a real odd suggestion, what about having the design transferred onto a writing surface/desk pad, like some of us fountain pen users use, or would that be too distracting? When it comes to preparing your art for print, I'd suggest online collaborations over taking it to a "professional" scanner. I know a lot of people would be happy to provide you with high quality cleaned-up images for a much lower price, especially if you give them credit on your site. Best of luck! Let me know if you'd like some recommendations for cleaning up those images. That's the same boat I'm in. For awhile I sold my notebook modifications on websites but it wasn't what I would call sucessful. Now I've branched out into woodblock prints so I am very interested in seeing the suggestions and comments in this thread.